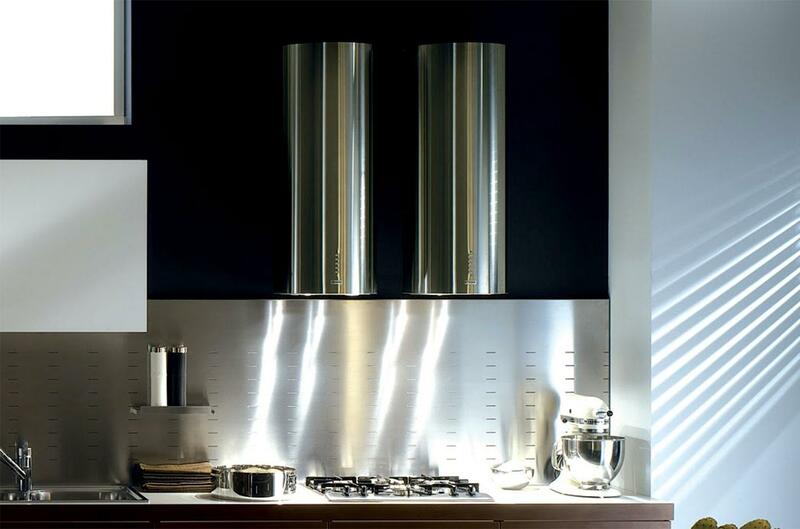 Designers around the world drool over Italian range hood maker Faber’s Pareo retractable cylindrical hood. While that model is sadly not available in North America, Faber’s US distributor does have a number of very unique range hoods that are. One that caught our eye was the Cylindra. The design is elegantly simple; just a 15” diameter stainless steel tube with recessed fan and lighting controls. Cylindra has an ample 600cfm blower (much better than the Pareo’s paltry 300cfm), with several operating modes including low-speed air freshening. The hood is available in wall- and island-mount configurations, with ventless conversion and remote control options. While design purists will covet the bare cylinder (or a budget-busting pair, as some of Faber’s gallery photos suggest) and crank the fan up to clear the room, practical chefs will probably choose to add the optional glass canopy kit that helps direct cooking vapors to the inlet (at the expense of a little chic). Stupid Americans, you don't need so much space for your washer and dryer! A number of different controllers are available on the Xbox One, from gamepads made by Microsoft, to third-party controllers loaded with special features. Here are the best you can buy.